Sealer Sales – product information, advice and much more! We are excited to introduce a couple of products in both our equipment and flexible packaging product line. Our popular CN-4520A shrink tunnel is now available with a PTFE meshed belt. This is an excellent option for operators trying to shrink small items which may fall in between the rods of the conveyor. Check out our video demo. Our SM-101 semi-automatic strapping machine is a general purpose strapping machine that can strap packages quickly and efficiently. Strapping cycle will automatically start when operator inserts strap. The machine will automatically shut down after a preset time to save electricity. We recommend this machine for strapping cartons in a light industry setting. Check out video demo. On the flexible packaging side, we are pleased to introduce our slider bags using the advanced Slide-Rite closure system. We carry both clear slider zipper bags and cushion slider zipper pouches. Lead times are 7-10 business days. Contact your local distributor for further information! Our CHILD RESISTANT BAGS can be used for any product that should be kept away from children: detergent pods, marijuana or any substance that may be dangerous to children can be stored in these bags. These bags include a closure zipper that requires two hands to open. The zipper can be manipulated by adults easily but will be difficult for children to access. These bags meet ASTM D3475-15 (American Society for Testing and Material Child Resistant) standards. To open, push the small lever up, then pull the zipper out to access items. To close, push the zipper lock until you hear a “click” from the bottom lever. These extra steps are easy for adults to follow but make it difficult for children to access what’s inside. Stock pouches are available in 3 sizes and in small minimum quantities of 50pcs. We carry the bags in both black and white. Our MC-300 motorized conveyor can be used in accumulation systems or with ink jet coding applications. Enjoy the best of both worlds with our new Square-Bottom Gusseted Bags! Now you can get the advantages of a traditional gusseted bag along with those of a stand-up pouch! Perfect for ground or whole bean coffee and loose tea leaves, our new Square Bottom Gusseted Bags allow even the lowest density product to sit narrow and sturdy on the shelves without ever worrying about tipping over. The paneled look of these bags makes them perfect for graphics, labeling, and hot stamping as well as degassing valve application. Available in a wide array of colors and laminated in foil or clear poly to meet any barrier requirement. Heavy Duty Vertical Band Sealer – seal your large packages! 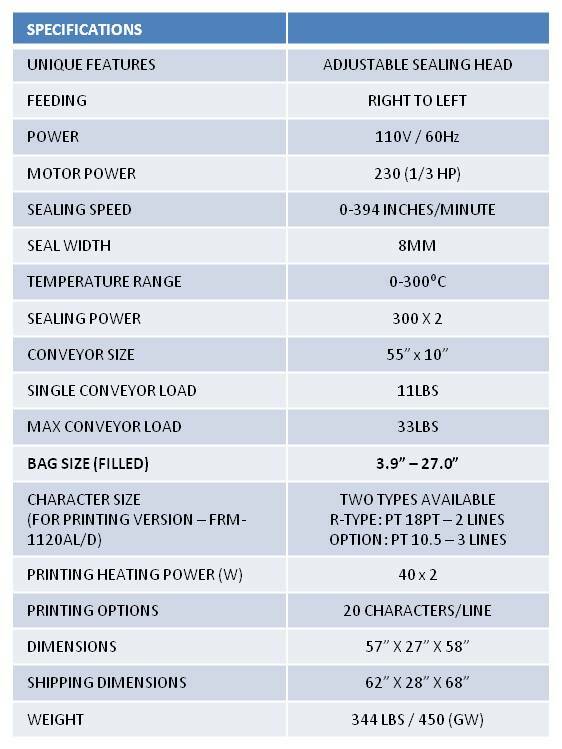 Looking for a band sealer that can seal your larger packages (bag height between 4″-27″)? 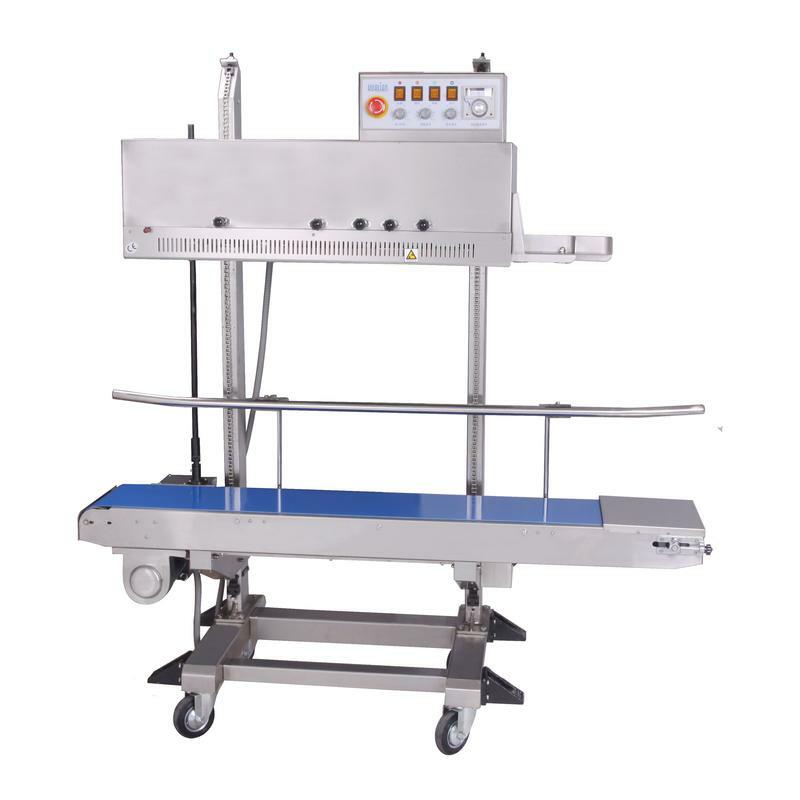 Have a look at our heavy duty FRM-1120LD stainless steel vertical band sealer. FRM-1120LD is designed to quickly and efficiently seal any thermoplastic material including PE, PPE, stand up pouches, gusseted bags, and moisture barrier bags. This sealer can be used in a wide array of files such as: food, medical, and cosmetic industries. While we focus primarily on sealing equipment and materials, every once in a while, we come across a product with great potential for changing the packaging world and we have no choice but to introduce the product to our distributors. 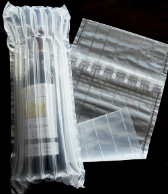 ColumnAir Packaging will revolutionize how your customers package and ship fragile items such as wine bottles. Simply place the product in the deflated bag; inflate the bag using a portable compressor at the single inflation point and the bag will inflate all around the product to create a form fitting cushion. What is amazing about our ColumnAir Packaging bags is each inflated column is connected via a series of one-way valves so if any of the columns are pierced during shipping, the other columns remain inflated! Bags are shipped deflated saving reducing warehouse space for the space constrained. Download our Spec Sheet for more information. Sealer Sales has been in the sealing business for over 30 years....we know our sealers! Our blog is dedicated to educating you all about sealers: how to choose a sealer, how to use a sealer, how to repair a sealer, and much more! Our distributor base is all over the US, Canada, and Mexico. Please contact us for a distributor near you. Shrink Wrapping is Back in Full Force! Best Practice: What the Heck Does Congeal Mean? Visit Us at PACK EXPO 2016 for FREE! California Crisps Seals with our Band Sealers! PACK EXPO 2015 – Booth S-7165 – Visit Us! Visit us at PACK EXPO Las Vegas for Free! Stand Up Pouches…what sealers should I choose? Seal and Code in One Step! What Does “Seal Width” Mean for a Sealer? Help! My Sealer Isn’t Working! Best Practices for Dealers – Send us your bag samples! How to Seal a Gusseted Bag?